Friday's author panels were spectacular and tomorrow there's so much more. Come see me: I'm the venue captain for the poetry events so I'll be at the Methodist Church most of the day. Listen to history come alive in the form of the CMU Contemporary Poets. Family, fate and secrets revealed through the lens of fiction. 11:00am - Deb Pilutti: Bear and Squirrel are Friends...Yes Really! 11:30am - Laurie Keller: We are Growing! Please note, each poetry reading will last approximately 30 minutes. Favorite cookbook authors will be on hand to sign books, answer questions, and give valuable cooking advice! #1 New York Times bestselling author, Letts presents the remarkable story of the heroic rescue of priceless horses in the closing days of World War II, in her new book The Perfect Horse. Elegant prose and meticulous research combine in this page-turning narrative for WWII and animal lovers alike. The plot, character and craft of a riveting mystery. From the New York Times bestselling author of Rules of Civility comes a transporting novel about a man who is ordered to spend the rest of his life inside Moscow's Hotel Metropol. Towles new book is titled A Gentleman in Moscow. Literary journeys into remote reaches of the Midwest explore the physical and emotional landscapes that shape us. Fast paced stories for the middle grade reader (8-12years) featuring compelling characters dealing with real world issues. Tender, thoughtful, moving and emotionally resonant stories of how we define family. Devoted to highlighting the works of distinguished writers statewide and to showcasing Michigan’s diverse voices in poetry, creative nonfiction, short fiction, and essays with the aim of encouraging the recognition of the state’s artistic and cultural heritage and its impact in Michigan, the Midwest and the nation. Harbor Springs, MI 49740 Young Adult Fiction: Smells Like Teen Spirit! Unconventional love stories that offer plenty of laughs, thrills and chills for teen readers. Three food writers discuss our cultural obsession with eating and the state of food today. Modern Day cowboy and Ucross, Wyoming resident Craig Johnson presents his latest release, An Obvious Fact, the 12th novel in the New York Times bestselling Longmire series which is the basis for the Netflix drama: "Longmire". Impeccably researched, thought-provoking and leavened with wit, Kenneth L. Woodward’s Getting Religion is perfect for readers looking to understand how religion came to be a contentious element in 21st century public life. The Harbor Springs Festival of the Book is hosting a fun, prize-filled evening of book trivia. Bring your own teams of 4-6 people, or come and we'll pair you with new bookish friends. Match your book trivia knowledge against that of other book enthusiasts in a fun venue. The event will be MC’d by cast members from the Little Traverse Theater’s fall production of Murder by Poe. Trivia will take place at The Pier Restaurant in Harbor Springs, Saturday, October 1st, at 9 pm. It's going to be a great night to be a book nerd, but you don't have to be one to compete! The charge will be $20 per team, or $5 for singles. All money raised will be donated to the Michigan Dyslexia Institute, Northern Michigan branch. Cash or checks only. Register your team at 9 pm, and get ready for fun-filled evening! Best selling cookbook author Domenica Marchetti talks about her latest release, Preserving Italy, over a lunch at the Birchwood Country Club featuring dishes from her cookbooks. Fiction: Lives in TransitionWriting fiction with a strong female voice. Writing the Great OutdoorsMan's impact and reflection on the natural world. Pulitzer Prize winning Washington Post editor and author David Maraniss discusses his critically acclaimed and award winning 7th book. Occasionally a novel appears and turns what we know topsy-turvy to shock us into seeing history through new lenses. The Underground Railroad is such a novel. It’s entirely original and is fantastic in the true sense of the word as it’s a fantasy of ultimate proportions complete with a literal underground railroad with stations, stops, and spurs where white tile walls and station agents can be touched and where an escaped slave can begin a journey north toward freedom. 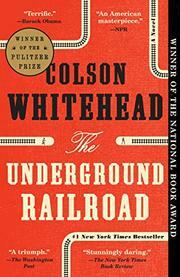 Colson Whitehead creates a realm in which Cora, a young teen-aged slave on a Georgia plantation, carefully plots her escape, but her plans go awry when she kills a young white boy who tries to capture her and she needs to quickly find a station on the Underground Railroad that lies beneath the cotton-filled land in the years just before the Civil War. Colson Whitehead has created an imagined world in which Cora becomes a Gulliver traveling down the rabbit hole and emerging in an alternate universe. However, that created universe, despite how different it might be from the pre-Civil War south of our history books, is still a land where the peculiar institution of slavery rules – and where embedding ourselves in that world helps us see how the cruel enterprise of slavery still shapes our world today. When you read the last page of The Underground Railroad, it’s just the beginning of your journey with the novel. This book will shape how you see everything. It makes it impossible to ignore. Summing It Up:The Underground Railroad is a masterpiece of invention that takes the reader into another world where slavery is made real in all its wrenching, horrific power. It's a tour de force that every American must read to understand history. Thankfully, it's gorgeously written and the characters, setting, and narrative together offer the reader an engaging story while enlightening and enlivening our shared world. Reading The Underground Railroad should be required of all over the age of sixteen. Note: The Underground Railroad is one of ten novels longlisted for the 2016 National Book Award. Winston Churchill fascinates us. The statesman who said, “History will be kind to me for I intend to write it,” wrote volumes about his own life as did many others. Most of us think of him as the Prime Minister who rallied the British during World War II and refused to surrender to Nazi Germany. We may recall how he modernized the British Navy and warned of the threat of the Iron Curtain, but Candice Millard tells a new story – one of Churchill in South Africa in the Boer War in 1899. Then 24 years old, Churchill had just lost his first campaign for parliament. His father, who died at the age of 45, had many accomplishments and the young Churchill didn’t want to lose time making himself known. He wanted to fight in a war and to be noticed while fighting. He’d served as an officer in India and Sudan and as a journalist in Cuba, but none of those exploits had gained him glory. Millard notes that in 1899 the British Empire covered more than a fifth of the world’s land surface and ruled about a quarter of the human race – “more than 450 million people on every continent and on the islands of every ocean.” It was the largest empire ever known. “The greatest threat was from the burden of ruling its own colonies.” After a century of conflict with the Boers (Dutch settlers) and new concerns about control of gold mines, the war began when the British rejected an ultimatum to withdraw troops from the Transvaal and the Orange Free State. Churchill set off as a journalist with his valet and crates of vintage wine to cover the brutal war, but just two weeks after his arrival, he was taken prisoner along with the soldiers he was following and aiding. He later managed a harrowing escape only to find himself alone in enemy territory with almost no resources to aid in traveling the hundreds of miles to safety. Telling of his capture, escape, and journey to freedom would make quite a story, but that’s just the beginning as Churchill returned to London, enlisted, and set off again for South Africa to liberate the men with whom he’d been captured and who were still imprisoned. This is a stirring adventure story filled with remarkable characters including Rudyard Kipling, Gandhi, Botha, and Paul Kruger, but it also affords a view of the experiences that molded Churchill into the man who was one of the twentieth century's most influential persons. Candice Millard offers a swashbuckling tale of young Churchill that should appeal to those who rarely read history. 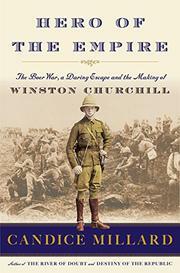 Summing it Up: Read The Hero of the Empire for a rip-roaring exploration of the early years of Winston Churchill. Quickly turn the pages as Candice Millard illuminates the Boer War in full Technicolor and shows young Churchill in his “Indiana Jones” years. Mischling ("mixed-blood" in German) was the legal term used in Nazi Germany to denote persons deemed to have both Aryan and Jewish ancestry. Author Affinity Konar uses the word to lead the reader into the horror chamber of Auschwitz where Josef Mengele’s experiments were “acceptable” because of the lineage of the Mischling victims. Poetic, ingenious, and exquisitely beautiful while simultaneously agonizing and sad, this is not a novel for sissies. I eschew plot-driven stories, yet I’m more able to stomach hard truths when the narrative compels me to turn the page. I was mesmerized by Konar’s brilliant use of metaphor and language, yet for this reader, the narrative didn’t propel it from a very fine novel to an exceptional one. Mischling deserves accolades for its subject matter, creativity, and prose, yet the narrative thread didn’t emotionally propel me as it might have done. Alternating between twelve-year-old twin sisters Pearl and Stasha’s views of their time in Mengele’s zoo, Mischling brilliantly highlights the emotional damage done by separating the twins as he experiments on them. As the sisters suffer primarily from their isolation from each other, Mengele’s physical and mental abuses seem even more horrific. Konar also paints kaleidoscopic pictures of villains, conflicted workers, and the other sets of twins within the camp with a brush that makes them come alive even as they make the reader want to escape. I admire Konar’s lack of sentimentality in her portraits of the many suffering children and even of Mengele, yet, I found myself comparing my connection to them to my deep and abiding empathy for each character in Anthony Doerr’s All the Light You Cannot See. Doerr created a tour de force with characters that still haunt me. Konar created a fascinating glimpse of the people and horror of Auschwitz, but for me, it isn’t a masterwork. I recommend it highly for its writing, however. Thinking of Konar’s name, Affinity, and its dictionary definition as a spontaneous or natural liking or sympathy for someone or something, sometimes expressed as a kinship, I can acknowledge that Affinity Konar created a world that gave this reader a sympathy for the characters and their plight, yet I didn’t develop the kinship needed to deem this a masterpiece. Still, I admire Konar’s skill in making Mengele real, yet never allowing him to highjack the story. The novel rightly belongs to the twins and to those real children and caretakers who suffered through Mengele’s brutality and whose lives inspired Konar’s well-researched novel. I’m grateful for Konar’s telling of their stories, yet, there were times when I could barely turn the page. Summing it Up: Mischling exquisitely bears witness to the atrocities perpetrated by Josef Mengele at Auschwitz, but reading of the abuses suffered by so many children in Mischling is almost impossible to endure. Twins Pearl and Stasha’s dual narratives offer prize-worthy, lyrical language and ask deep questions about forgiveness, yet this novel is only for those able to stomach those horrors.